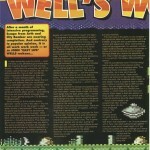 Another Jon Wells title which sadly seems to have got lost along the way. 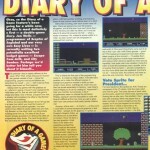 I first read about City Bomber whilst Jon was wrote a special diary for Commodore Force. 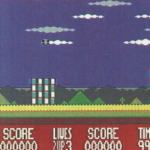 As well as working on “Escape From Arth”, Jon was working on a neat title based on a classic Vic 20 game called “Bomber Run” by K-Tel on a Double Sider tape. 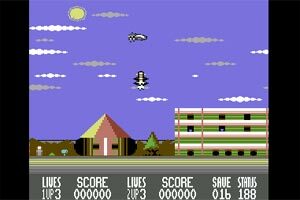 Bomber Run had you flying over a blue cityscape, and you had to bomb all the buildings to eventually land. It was pretty much done in BASIC, but it was very impressive and certainly very addictive. 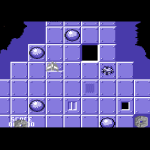 Jon too found the game as addictive as I did, and began creating a modernised version for the C64. 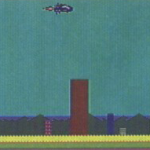 It was modernised in the sense of graphics and sound obviously, and of course scrolling and other effects; but you particularly had an extra objective…. You had to save so many people, by picking them up before you bomb the ground to death. 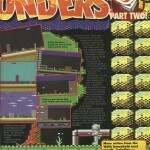 A good idea, but slightly flawed in the preview which came out on Commodore Format’s powerpack. 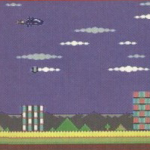 You see, it was so tricky and you had to be pixel perfect to pick the people up… most time you would end up crashing your ship. But also some people were stuck inside buildings, and you couldn’t reach them anyway (Bombing near by could set them alight). It may have been possible to complete the level, but I certainly couldn’t without a cheat. Anyway, apart from the minor problem, the game itself was a great update to the classic theme, and instantly I signed up and pre-ordered the game along with Escape From Arth and Blitz 2000. 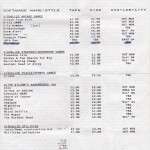 Sadly after time went past, Jon had sales problems with EFA and Blitz 2000. About 20 people in total bought both games, which wasn’t enough jusitification for Jon to finish off the other games. 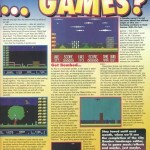 The enthusiam should have earnt the support of many to keep the games scene alive, but it didn’t. City Bomber got shelved, and was put on the back burner. 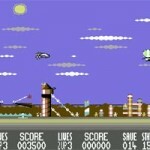 Supportware offered City Bomber a lifeline, but again after failings of this new scheme, City Bomber remained on the shelf. Today, the game still remains incomplete… and it seems a very very long way off to ever seeing the light of day. Jon tells me that the game is basically complete, and just requires some minor tweaking. It *could* be released one day, but at the moment we have a GTW. In addition to the above, the game sported some awesome music by Feekzoid and Chris Lightfoot. Feekzoid did the main tune, which was squeezed into 2 channel for Jon to include sfx aswell. 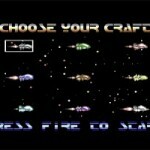 Chris Lightfoot provided the ship selection tune, where you could choose a particular ship to fly (A neat touch). Graphically the game was not spectacular, but a little bit more paint work would soon fix any minor bits. After seeing Blitz 3000, Jon could easily improve things. So now we wait and see if a finished game will ever surface… otherwise GTW will one day be hosting a nearly complete game. It will be out someday, but lets just hope its not in here with the rest of the unfinished gems. Awesome little game which should be finished…. The preview was stunning, when I played it. 🙂 Very promising! 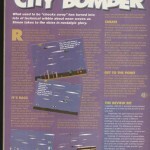 By the way I did several Bitmap Screens for City Bomber, I did them with the intention of Jon using them for the Game. He was very kind and said they could be used to advertise the Game ( I think he was being polite, I was NOWHERE near as good as him at doing Graphics at the time… ). Andrew has them, perhaps if you ask him nicely he will send them on if thats not being too boring or sad of me to suggest ? I forgot about that! .. I have asked Andrew and if he passes them over, i’ll add them to the entry. Even if not used, they were intended for the game, so worth adding! Thanks Wayne. I think the case is closed on this one. Pity because it’s a promising little game and fun too. Ah, now I honestly think this one will make it. It is pretty much complete already, and just needs some new titles and music to finish it off.